Artist Nell Brinkley's Brinkley Girls, were the delightful, bright-eyed and bow-lipped women of her newspaper columns throughout the early 1900s. The Brinkley Girls became household names across America. Nell Brinkley was born in Edgewater, Colorado on September 5, 1886. At the age of 17 she left home to pursue a career as an artist. After failing at her first job with the Denver Post, she went to art school for two years. She later worked for the Denver Times and after two years of drawing pretty girls for the paper she was discovered by William Randolph Hearst and hired as an illustrator for his newspaper the New York Evening Journal. 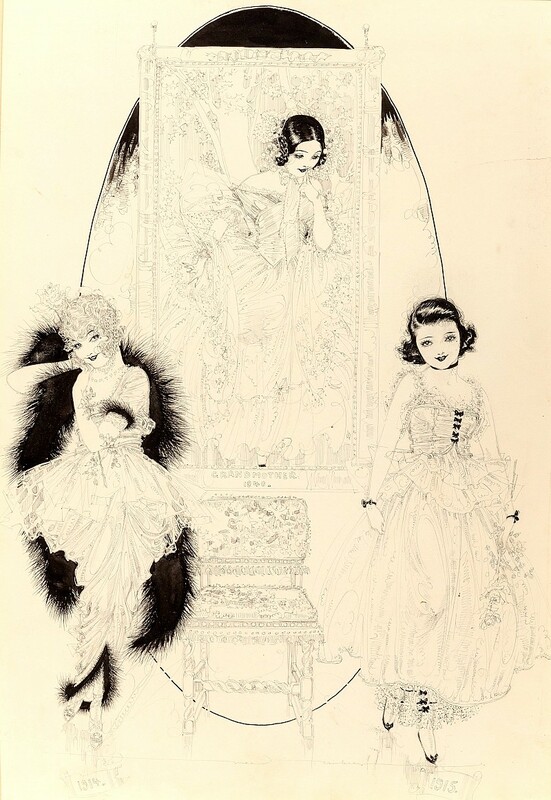 At the Journal, Nell Brinkley illustrated columns about famous actresses, covered fashion and wrote reviews of Broadway shows all with her trademark style of beautiful women. Brinkley drew real women too, including actresses Lillian Gish and Mary Pickford as well as Hearst's mistress, entertainer Marion Davies. In 1920 Nell Brinkley married Bruce McRae, the son of a famous stage actor. Nell gave birth to one son, Bruce Robert McRae in 1923. The couple divorced in 1937. In 1918 Brinkley began producing full-page color serials for the covers of the Hearst newspapers' Sunday sections. Although Brinkley's artistic style adapted to the times, by the 1930s her artwork was falling out of favor with the public. In 1937 she resigned from newspaper work. In 1944 Nell Brinkley died of cancer.